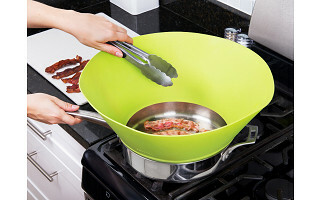 With this silicone splatter guard inside the rim of any pot or pan, spattering and sizzling food won’t spray out. Frywall keeps all the sautéing, frying, and marinating food contained even as it’s exposed to high temperatures. And even though the walls are high (kind of like a dog cone over your pan), the soft silicone is angled for easy access to the food. So you can flip, brown, and sear . . . while your shirt, kitchen, and you stay protected. To clean, soap and rinse Frywall or stick it in the dishwasher. The silicone collapses down flat to save space when it’s stored. Keep the counter tidy and the path straight—from the pan to your plate. Hi all. I’m excited to launch Frywall with The Grommet. I think you'll enjoy cooking a lot more when there’s less mess. I’d be delighted to answer you questions. What drove you to create Frywall? @Mike Hi Mike, It was a duck breast that did it. I always hated cleaning splatter and sometimes avoided making certain foods just so I wouldn't have to clean it up. Burgers, steaks, fried chicken -- loved them all and almost never made them. But it was the duck breast that did it. I made some for my family one weekend, and they loved it. Two weeks later, they begged for a repeat. I wanted to appease them, but needed to find a way to control the mess. I jury-rigged something out of aluminum foil. That was the spark. It worked so well, I decided I need to develop the product and share it with others. @Yair The pans shown in the demo have straight sides; does this work with pans with more sloped sides? What is the temperature limit of the silicone? If it were to get in the grease/oil in the pan. I was wondering that as well, as it will be resting against the hot metal of the frying pan. @David Hi David, Thanks for the question. The silicone we use can withstand sustained temperatures of unto 450F. To put that in perspective, most cooking oils begin to smoke and burn when they reach 400, and deep frying is done at 350F. So there is no need to worry about Frywall coming in contact with the oil of the pan bottom. @Yair can it be put into the oven? @Anita Hi Anita, Absolutely. You'll need to use one of the lower racks to keep Frywall from touching the top the oven. The only other caveat is broiling. That's a bit too hot, even for Frywall. @R.J. Thanks, RJ. It's true, silicone doesn't conduct heat much. So the top the Frywall stays cool enough to handle, even when your pan is searing hot. @Yair you should make one for the oven too! imagine how less often you'd need to clean your oven! @Joyce Hi Joyce, Great point. You can use Frywall in the oven! (Just not when broiling). Frywall's sides are fairly high, so you'd need to use one of the lower racks on the oven. But otherwise, you're good to go! What size pans/skillets does it fit? In other words, how adaptable is the Frywall to various sizes of pans/skillets? Hi Marye, Frywall comes in two size 10" and 12". 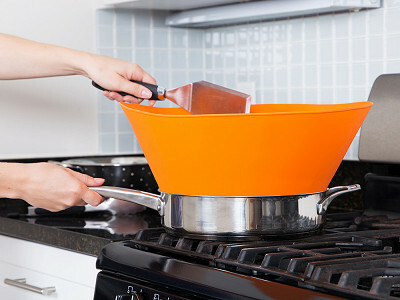 When shopping for pans, you'll see quite a bit of variance among pans with the same nominal size. In other words pans advertised as 10" usually have inside diameter that range from 9.75 to 10.5 inches. 12" pans are usually 11.75 - 12.5" measured rim to rim. Frywall will fit all these typical sizes. But you should measure your pan to make sure your pan is within these ranges. Frywall won't fit if your 10" pan is really 9.5" (though that's rarely the case). Hope that helps. @Yair Last Spring I purchased a Black Cube frying pan from Grommet, and it is now my absolute favorite go-to pan. (Non-stick without eating teflon.) But alas, I see now that it is 9-1/2" and I really want your Frywall to solve the rest of my kitchen annoyances. Even if I ordered their larger pan, it is 11." Feels like I am between a rock and a non-stick place. Yair, I like it but it is a little too expensive for me. @Elizabeth Hi Elizabeth, High-temperature, FDA-compliant silicone is an expensive material, and Frywall uses a lot of it! To manufacture Frywall, we had to build the largest ever mold for a silicone kitchen tool. The photo shows it above the bottom of the pan, but on the inside. What keeps it off the bottom? @Mary Hi Mary, I'm glad you asked the question, because it leads to an important Frywall feature. 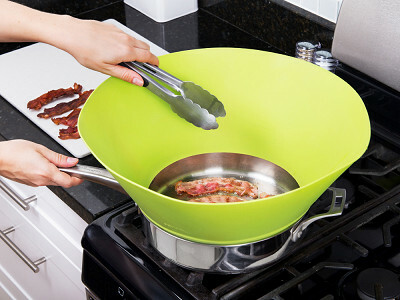 Frywall rests on the inside rim of your pan, pot, or wok -- a bit like the bottom of a funnel rests on a bottle. We designed it this way so you have full access to the bottom of your pan and so that Frywall wouldn't get in the way of your cooking. So you get the experience of cooking with an uncovered pan with none of the mess. @Yair when I cook bacon I have been hit in the face with the grease so how does this keep the grease contained? @Loretta J Hi Loretta, Frywall stops the splatter that flies sideways and would otherwise end up on your stovetop. The splatter that goes straight up falls back into the pan. @tony Hi Tony, Thanks for the question. Frywall super easy to clean. You can sponge it off in the sink, or put it in the dishwasher. Silicone naturally repels oil, so you can use normal or economy mode on your dishwasher (no need for "pots and pans" mode). Frywall doesn't get gunked with stick oil the way splatter screens do. After use, Frywall rolls into a storage sleeve the size of a pint glass. How do you clean it? Can it go in the dishwasher or does it need to be hand-washed? @Randall Hi Randall, Yes, either way will work - by hand or in the machine. Cleans up in a jiffy. More details in the response above. Just as soon as I decide on a size, I'm sure it will not be the size I need at the time. A universal size would be great. @Sara Hi Sara, If you're like me, you probably have just a few go to pan and pots. If you measure them, I bet a few will match either the Frywall 10 or 12. I've experimented with adjustable size designs, but haven't quite cracked the code. The features that make the sized Frywalls so practical is that they are easy to use, clean, and store. The illustrations I've seen seem to show straight-sided pans. 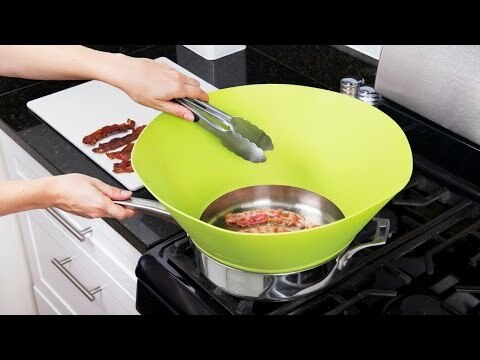 Will the Frywall work with skillets that have sloping sides? For instance, my largest skillet measures 12" diameter on the rim, but the inside/cooking surface measures 8.5". I love this idea and would be quite interested in purchasing the product. @Candy Hi Candy, Great question. As long as your pan measures between 11.75 and 12.5" from inside rim to inside rim, Frywall 12 will work. The bottom of Frywall is designed to rest on the side of the pan rather than the bottom. That way you have complete access to the entire cooking surface and Frywall never gets in the way. @Yair How tall is a Frywall? @Barbara Hi Barbara, Frywall 10 is 6.5" tall. Frywall 12 is 7.5" tall. Both Frywalls roll up after use and fit into a storage sleeve the size of a pint glass. The storage sleeve is included. I normally fry bacon on an electric griddle that is oblong. The grease splatters everywhere. Are your splatter guards adjustable to fit a pan that isn't round? Also can they be used with an electric deep fryer? @Teresa Hi Teresa, Frywall is currently only available for round pans and pots. We'd love to eventually make them for rectangular griddles. One of the challenges is that these have fewer standard sizes. Cost is prohibitive - however, did you consider making this so that it telescopes - and can be flattened for storage? Finding a place for something so large in a limited kitchen area would be difficult as well. @Joann Thanks for the comment. Frywall rolls up after cleaning and takes up a minimal amount of space. As Yair noted above, it has a storage sleeve about the size of a pint glass. OMG what a freaking awesome invention!! I will have to save a few coins since I will want to buy several for myself and family members. I can't tell you how many times I opt to cook something else because I don't want to clean my gas stove up. How sturdy is the silicone ? Like if I wanted to set a lid down inside for simmering would that work? @staci Hi Stacy, That will absolutely work! You can set the lid right into the Frywall and continue to cook you meal. Is the 12" drywall 12"high or round? What size pans and pots will it fit? @Guest Hi, The Frywall 12 fits pans and pots with 12" diameters. It is 7.5" high. This is for the folks at the Grommet. First the smaller guard will not fit my pans so I decided to order the more expensive 12" guard because it is a GREAT item! I had the Frywall in my cart and saw the $11 shipping charge! That is too much shipping for a $28 item! I'm not buying it for that reason. What a shame! @Mike What a CROCK of doodoo! That is why the shipping is so ridiculous...you figure you can manipulate people into buying products that they don't even want, just to get the free shipping. Most of us are NOT that stupid. Hi Sandra, I was mainly kidding. Hence the smiley face. The shipping rate is not set so we can hoodwink you into buying more. It's at the price it is because the shape of Frywall forced us to put it in a larger box than we expected and the silicone is heavier, which speaks to its durability. Hi Julie, I would measure it to be sure. It might not be a perfect fit, but the silicone is quite flexible so it's definitely possible. This thing is waaaaaay overpriced. Before checking the price, I looked at it, and in my opinion, it should not be more than $1299. I'd argue, Sandra, that $1299 is a touch overpriced. The price is a reflection of the materials used and time saves not cleaning up a stove and turning your kitchen into a tinderbox. We got you covered, Kathryn! 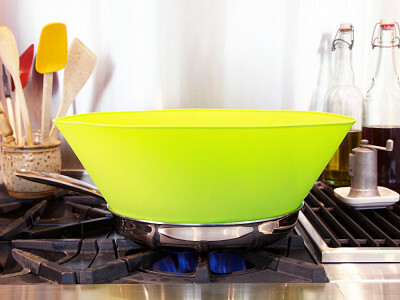 With this silicone splatter guard inside the rim of any pot or pan, spattering and sizzling food won’t spray out. Frywall keeps all the sautéing, frying, and marinating food contained even as it’s exposed to high temperatures. And even though the walls are high (kind of like a dog cone over your pan), the soft silicone is angled for easy access to the food. So you can flip, brown, and sear . . . while your shirt, kitchen, and you stay protected. To clean, soap and rinse Frywall or stick it in the dishwasher. The silicone collapses down flat to save space when it’s stored.